President Donald Trump on Wednesday walked out of a meeting with congressional leaders that was called to find a way to end the government shutdown. Trump called the meeting a waste of time, while one Democrat said Trump threw a "temper tantrum." President Donald Trump walked out of his negotiating meeting with congressional leaders Wednesday — "I said bye-bye," he tweeted— as efforts to end the 19-day partial government shutdown fell into deeper disarray over his demand for billions of dollars to build a wall on the U.S.-Mexico border. In a negotiating session that was over almost as soon as it began, Democrats went to the White House asking Trump to reopen the government. Trump renewed his call for money for his signature campaign promise and was rebuffed. Republicans and Democrats had differing accounts of the brief exchange, but the result was clear: The partial shutdown continued with no end in sight. Hundreds of thousands of federal workers will miss paychecks on Friday; a little more than half of them are still working without pay. Other key federal services are suspended, including some food inspections. And as some lawmakers expressed discomfort with the growing toll of the standoff, it was clear Wednesday that the wall was at the center. Trump revived his threat to attempt to override Congress by declaring a national emergency to unleash Defense Department funding for the wall. He's due to visit the border Thursday to highlight what he declared in an Oval Office speech Tuesday night as a "crisis." Democrats say Trump is manufacturing the emergency to justify a political ploy. That debate set the tone for Wednesday's sit-down at the White House. Republicans said Trump posed a direct question to House Speaker Nancy Pelosi: If he opened the government, would she fund the wall? She said no. Senate Democratic leader Chuck Schumer said Trump slammed his hand on the table, said "then we have nothing to discuss" and walked out. Republicans said Trump, who passed out candy at the start of the meeting, did not raise his voice and there was no table pounding. Pelosi said Trump "stomped" out of the room and was "petulant." Republicans said he was merely firm. Trump had just returned from Capitol Hill, where he urged jittery congressional Republicans to hold firm with him. He suggested a deal for his border wall might be getting closer, but he also said the shutdown would last "whatever it takes." Trump insisted at the White House: "I didn't want this fight." But it was his sudden rejection of a bipartisan spending bill late last month that blindsided leaders in Congress, including Republican allies, now seeking a resolution to the shutdown. The effects are growing. The Food and Drug Administration says it isn't doing routine food inspections because of the partial federal shutdown, but checks of the riskiest foods are expected to resume next week. The agency said it's working to bring back about 150 employees to inspect more potentially hazardous foods such as cheese, infant formula and produce. FDA Commissioner Scott Gottlieb said the agency can't make the case that "a routine inspection of a Nabisco cracker facility" is necessary during the shutdown, however. He said inspections would have ramped up this week for the first time since the holidays, so the lapse in inspections of high-risk foods will not be significant if they resume soon. Republicans are mindful of the growing toll on ordinary Americans, including disruptions in payments to farmers and trouble for home buyers who are seeking government-backed mortgage loans — "serious stuff," according to Sen. John Thune, the No. 2 Senate Republican. "I addressed the things that are very local to us — it's not just those who don't receive a federal paycheck perhaps on Friday, but there are other consequences," she said, mentioning the inability to certify weight scales for selling fish. The president's response? "He urged unity." Migrants from Mexico to Honduras are refuting claims made by President Donald Trump in his prime-time address, in which he defended his demand for a wall on the southern border with Mexico by alleging that undocumented immigrants bring crime and drugs into the U.S. at high rates. That unity was tested late Wednesday when the House passed a spending bill, 240-188, to reopen one shuttered department, Treasury, to ensure that tax refunds and other financial services continue. Eight Republicans joined Democrats in voting, defying the plea to stick with the White House. Democrats said before the White House meeting that they would ask Trump to accept an earlier bipartisan bill to reopen the government with money for border security but not the wall. Pelosi warned that the effects of hundreds of thousands of lost paychecks would begin to ripple across the economy. "The president could end the Trump shutdown and reopen the government today, and he should," Pelosi said. "I think we might work a deal, and if we don't, I might go that route," he said. Republicans are particularly concerned about such a threat, seeing that as an unprecedented claim on the right of Congress to allocate funding except in the direst circumstances. 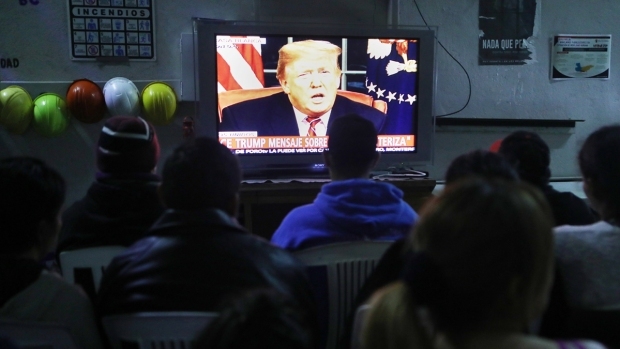 Trump did not mention the idea of a national emergency declaration Tuesday night. A person familiar with deliberations who was unauthorized to discuss the situation said additional "creative options" were being considered, including shifting money from other accounts or tapping other executive authorities for the wall. Trump on Wednesday floated ideas for a broader immigration overhaul. Trump ally Sen. Lindsey Graham, R-S.C., has suggested a compromise that would include wall funding as well as protecting some immigrants — young "Dreamers" and those in Temporary Protective Status, two programs Trump is eliminating — from deportation.